On November 19, 2015, the Auschwitz Institute for Peace and Reconciliation held a celebratory launch event in New York for the first publication under its new banner: the Sheri P. Rosenberg Policy Papers in Prevention (PPP). The series’ debut launch is entitled “Reparations for Crimes Against Humanity as Public Policy – Argentina’s Relationship with the Past: From the Individual to the Collective as a Tool for Prevention,” and was written by AIPR’s Senior Adviser for Latin America Programs, Andrea Gualde. 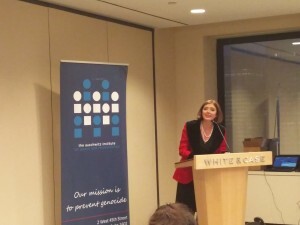 Generously hosted by White & Case LLP, the event featured remarks from Owen Pell, Board Member of AIPR and Partner at White & Case, Tibi Galis, Executive Director of AIPR, Kerry Whigham, Scholar at New York University, as well as the paper’s author, Ms. Gualde. Mr. Pell opened the event with observations about the importance of the work being done by Ms. Gualde and AIPR. 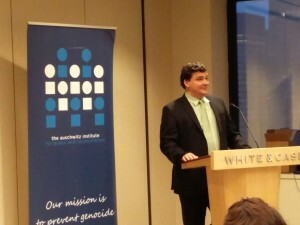 AIPR’s Executive Director, Tibi Galis, introduced the Sheri P. Rosenberg Policy Papers in Prevention series and contextualized the new initiative within the broader efforts of the Auschwitz Institute. Mr. Whigham, who translated the paper from Spanish to English, took to the podium after Dr. Galis to introduce the scholarship of Ms. Gualde and to articulate several reasons as to why the work represented by this publication is so important. Ms. Gualde then discussed her motivations and process for synthesizing this work and highlighted a few key passages before taking the time to answer several questions from the audience. To learn more about AIPR’s Sheri P. Rosenberg Policy Papers in Prevention series or to obtain a copy of Reparations for Crimes Against Humanity as Public Policy, please contact Rob Scharf. 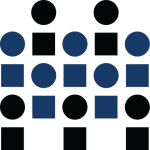 For more information on AIPR’s work with the Latin American Network for Genocide and Mass Atrocity Prevention and other programming in Latin America, click here.